Research also identifies pollinators’ favourite flowers, including brambles, buttercups, dandelions, lavender and borage. Yards, weedy corners and fancy gardens are all urban havens for bees and other pollinators, a study has found. FRANCE — In the report, the World Resources institute suggests ways of feeding almost 10 billion people by 2050. Food demand is set to rise by over 50%, with demand for animal-based food products (meat, dairy and eggs) likely to grow by almost 70%. Hundreds of millions of people already go hungry, Farming uses around half the world’s green areas and generates a quarter of global greenhouse gas (GHG) emissions. 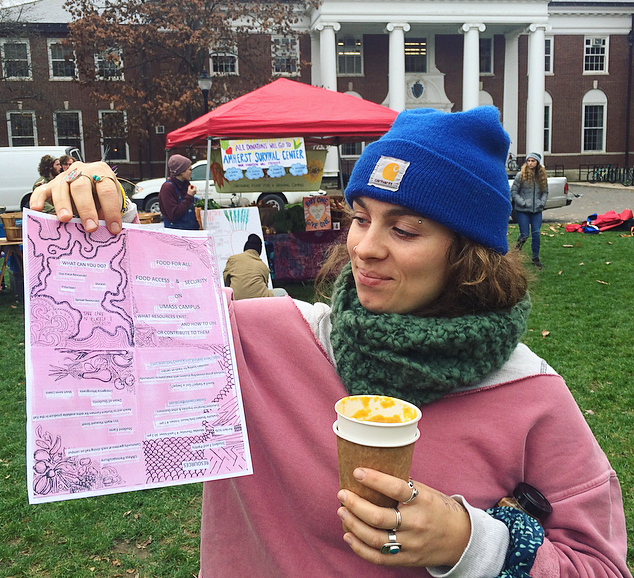 UMass Food for All network handed out free vegetables and educated people about food security at UMass while other students sold their original work at UMass’ second to last “Food For All Farmers Market,” a market which has grown this season. Everything you wanted to know about what’s happening in farming this month! The following list of topics and articles was published as a public service by Grow Calgary, the largest urban community farm in Canada. Jenny’s Food and Ag Update is published once a month by Jenny Huston of Farm to Table Food Services in Oakland, CA. To be added to the mailing list, contact Jenny at chefjennyhuston@yahoo.com. Organic farming with gene editing? The question of what do we mean by organic agriculture is tested here. Is it “food grown without synthetic biotoxins and fertilizers?” Or does organic agriculture include a commitment to family farms and social justice? What do you think? BERKELEY, Calif. (THE CONVERSATION) — A University of California, Berkeley professor stands at the front of the room, delivering her invited talk about the potential of genetic engineering. Her audience, full of organic farming advocates, listens uneasily. She notices a man get up from his seat and move toward the front of the room. Confused, the speaker pauses mid-sentence as she watches him bend over, reach for the power cord, and unplug the projector. The room darkens and silence falls. So much for listening to the ideas of others. EDITORS NOTE: The real costs of industrial agriculture are not included in the price of food. We all pay for “cheap food” in pollution, unjust labor practices, and poor public health. To learn about alternatives, check out our online Pigs & Poultry class! The UMass Carbon Farming Initiative is the first temperate climate research silvopasture plot at the University of Massachusetts. Carbon farming is the practice of sequestering carbon from the atmosphere into soil carbon stocks and above ground biomass. Silvopasture, a carbon farming practice is the intentional combination of trees and livestock for increased productivity and biosequestration. The plot is a 1 acre silvopasture system at the Agriculture Learning Center (ALC) that integrates a diverse planting of complex hybrid chestnuts systematically arranged to ensure ease of management for rotational grazing sheep. Establishment of the initiative has been funded by the Sustainable Food and Farming Program (SFF) and a grant from the Sustainability Innovation and Engagement Fund (SEIF) and is managed by Stockbridge School of Agriculture Faculty Lisa DePiano and Nicole Burton and SFF students. According to Project Drawdown, a broad coalition of scientists, policy makers, business leaders, and activists that have compiled a comprehensive plan for reversing climate change, silvopasture is the highest ranked agricultural solution to climate change. Silvopastoral systems contribute to climate change mitigation both through the direct drawdown of atmospheric carbon into soil and biomass and through the reduction in the greenhouse gas emissions emitted by industrial livestock systems. With the growing demand for meat and dairy products, and the limited amount of land available it is essential that we identify agricultural practices that are part of the solution rather than exacerbating the problem. In order to get to down to 350 ppm of atmospheric CO2, the safe amount of concentration of carbon in the atmosphere, we need to have NET Zero carbon emissions and remove 300+ billion tons of carbon from the atmosphere.Research suggests that silvopasture systems are capable of storing as much as 100 tons of Carbon (367 tons of CO2) per acre while adding the yields of tree crops to the existing animal systems, and ecological benefits like reduced nutrient runoff, erosion, and animal stress from heat and wind. Traditional silvopasture systems, such as the dehesa in Spain and forest pastures in Scotland, have existed for centuries but more research and development is needed for cold climate sites in the United States. Establish a concrete example of carbon farming. This example will function as an outdoor classroom for SFF and related courses as well as a demonstration site for farmers and policy makers. Empower students as emerging leaders in the cutting edge fields of Permaculture, carbon farming and sustainable animal husbandry.